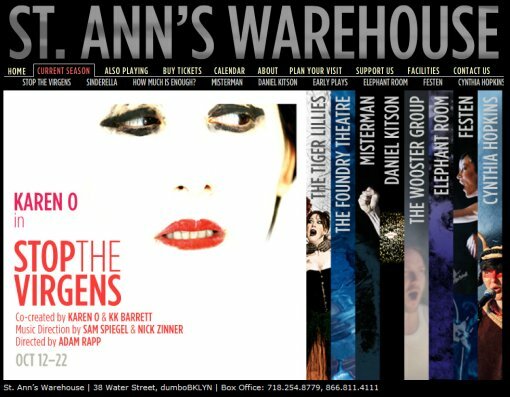 The 2011-2012 season schedule for St. Anns Warehouse (the last to be held in its current location) has been announced and it looks pretty exciting. Downtown auteur Richard Maxwell will be directing an adaptation of Eugene O’Neil‘s Glencairn Plays entitled Early Plays, Daniel Kitson is back with a new one man show, St. Anns favorite Cynthia Hopkins is putting on a special one night concert, and last but not least, Yeah Yeah Yeahs frontwoman Karen O is making her St. Anns debut in the Adam Rapp directed psycho-opera Stop The Virgens. That’s just the tip of the iceberg of course, view the full 2011-2012 season schedule after the jump.